This article was published in Butterworths Journal of International Banking and Financial Law in September 2014 (the PDF includes tables not included in this version). Enforcement authorities in the United States and Asia reportedly are investigating JPMorgan and other financial institutions for potentially corrupt employment and business relationships with family members of government officials. The investigations underscore policy links between anti-corruption and anti-money laundering regimes where dealings with Politically Exposed Persons (PEPs) are involved. 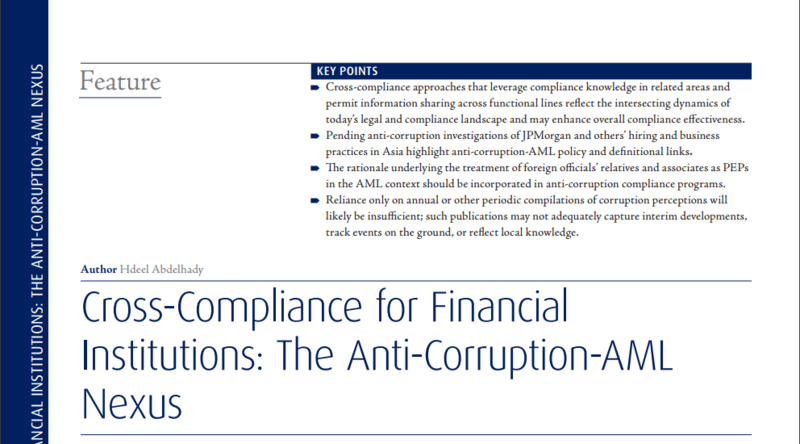 This article briefly discusses the pending investigations and the anti-corruption-AML policy nexus, and suggests, with respect to PEPs and more generally, that financial institutions facilitate fluidity in their compliance programs to allow for the sharing of information and adaptation of compliance protocols across (sometimes impermeable) internal functional and disciplinary lines. (Note: The terms “investigation”, “inquiry”, and “probe” are used interchangeably to describe the JPMorgan and related developments and have their ordinary meanings—no indication of legal status of developments is intended. For additional background about the investigations discussed, see the compilation of select source and other links provided as a companion to this article, at www.masspointpllc.com? ). In August 2013, the U.S. Department of Justice (DOJ) warned “anyone in the financial services industry who thinks bribery is the way to get ahead . . . [that it] would not stand by while brokers or others try [to] rig the system to line their pockets, and [would] continue to vigorously enforce the [U.S. Foreign Corrupt Practices Act] and money laundering statutes across all industries.” (Press Release, U.S. Department of Justice, Two U.S. Broker-Dealer Employees And Venezuelan Government Official Charged In Manhattan Federal Court For Massive International Bribery Scheme, May 7, 2013). The warning—included in an announcement of criminal charges against former employees of a U.S. broker-dealer and a Venezuelan state bank official for bribery, money laundering, and related offenses—highlighted a clear link between corruption and money laundering: the former is an antecedent and legal predicate of the latter. Also in August, JPMorgan disclosed that it had received from the U.S. Securities and Exchange Commission (SEC) a request for “information and documents relating to . . . the Firm’s employment of certain former employees in Hong Kong and its business relationships with certain clients.” (JPMorgan Chase & Co. Quarterly Report (Form 10-Q) (Aug. 7, 2013). Subsequent disclosures and news reports revealed that enforcement authorities—the DOJ and foreign enforcement authorities also initiated inquiries—were interested in whether JPMorgan offered or extended employment or business to the children of Chinese government officials to obtain business advantage. (See, e.g., JPMorgan Chase & Co. Quarterly Reports (Forms 10-Q) filed Nov. 1, 2013 and May 2, 2014 and Annual Report (Form 10-K) filed February 20, 2014); Jessica Silver-Greenberg and Ben Protess, U.S. Broadens Investigation of JPMorgan’s Hiring in Asia, N.Y. Times, Nov. 1, 2013; JPMorgan’s Fruitful Ties to a Member of China’s Elite, N.Y. Times, Nov. 13, 2013). From the standpoint of U.S. authorities, such employment and business—if furnished with corrupt intent, i.e., to obtain business benefit from a foreign official—might constitute violations of the U.S. Foreign Corrupt Practices Act (FCPA), a federal anti-bribery law that prohibits the direct or indirect offering, promising, or giving of “anything of value” to a “foreign official” for the corrupt purpose of obtaining business advantage. (Foreign Corrupt Practices Act of 1977, as amended, 15 U.S.C. §§ 78dd-1, et seq.). Outside of the United States, enforcement authorities are reportedly examining potential violations of local anti-corruption laws; e.g., a related investigation by Hong Kong’s Independent Commission Against Corruption recently led to the arrest of JPMorgan’s former vice chairman of investment banking for Asia. (See, e.g., Jerin Matthew, Ex-Head of JPMorgan China Investment Banking Arrested by Hong Kong Anti-Graft Agency, International Business Times, May 21, 2014). News of the inquiries into JPMorgan’s employment relationships with the children of Chinese officials reportedly has sent “shudders through Wall Street . . . Virtually every [financial] firm has sought to hire the best-connected executives in China . . . [who] more often than not . . . are . . . ‘princelings,’ the offspring of the ruling elite.” (Andrew Ross Sorkin, Hiring the Well-Connected Isn’t Always a Scandal, N.Y. Times, Aug. 19, 2013; see also Enoch Yiu and George Chen, Banks will not end connected hiring; Financial institutions say employing the children of government officials or important people happens all over the world, South China Morning Post (Hong Kong), Sept. 16, 2013). Given the apparent prevalence in the financial services industry of connected hiring and U.S. enforcement authorities’ record of conducting “industry sweeps” in the context of FCPA enforcement, it comes as no surprise that at least five other U.S. and non-U.S.-based financial institutions—Goldman Sachs Group Inc, Morgan Stanley, Citigroup Inc, Credit Suisse Group AG and UBS AG—reportedly have been contacted by the SEC about their hiring practices. (See, e.g., Reuters, U.S. SEC expands probe into top banks’ hiring in Asia: WSJ, May 16, 2014). The JPMorgan and similar inquiries conjure anti-corruption-AML policy and definitional links that are perhaps less obvious than the factual and rule-based associations immediately apparent in standard cases involving bribery as a predicate offence to money laundering. In the case of the FCPA and similarly aimed anti-corruption laws, a party’s status as a “foreign official” or equivalent triggers bribery prohibitions. In the AML context, government officials and their close family members are, by definition and effectively, selfsame—they are, e.g., defined as Senior Foreign Political Figures (SFPFs) under U.S. law and are treated as Politically Exposed Persons (PEPs) under international standards. In banking transactions their status, without more, triggers enhanced due diligence and other obligations for financial institutions. (See, e.g. Financial Action Task Force, Guidance, Politically Exposed Persons (Recommendations 12 and 22), June 2013 (discussing, inter alia, treatment of PEPs and close family members) (“FATF Guidance”); Special Due Diligence for Correspondent Accounts and Private Banking Accounts, Definitions, 31 C.F.R. 1010.605 (2013) (United States)). While financial institutions subject to the FCPA or other anti-corruption mandates are not forbidden by those laws from hiring or transacting business with foreign officials’ family members, their dealings with them should be approached with special caution, in light of AML rules classifying the same persons as high risk. As the Financial Action Task Force has explained: “family members and close associates of PEPs should be determined to be PEPs because of the potential for abuse of the relationship for the purpose of moving the proceeds of crime [including corruption], or facilitating their placement and disguise, as well as for terrorist financing purposes.” (See FATF Guidance). The rationale articulated by the FATF—that familial relationships are susceptible to abuse—should inform (but not necessarily foreclose) financial institution relationships with foreign officials’ family members, close associates, or other relations to heighten internal awareness of potential corruption across functional lines and potentially enhance compliance outcomes. Practically, this would require the adoption of frameworks that are responsive not only to the letter of the law (which is common), but also the policy bases and objectives advanced by related laws or regulations. Of course, the content and implementation of any compliance program must be tailored for, inter alia, entity size, organisational structure, jurisdiction(s) of operation, lines of business, counterparty profiles, and internal or external resources available to effectively implement compliance programs. However, strong compliance programs should include—in addition to standard training, reporting, auditing, etc.—mechanisms that permit the tracking of legal and policy nexuses, predictive identification of problem areas, and leveraging of compliance resources across functions. Some steps for the practical implementation of PEP-related anti-corruption-AML policy links and cross-compliance more generally might include the following, which are consistent with AML and FCPA risk-based approaches and facilitate more comprehensive, localized, and fluid compliance practice. Cross–Fertilization. Applying proven AML policies and procedures, such as know-your-customer (KYC) vetting, to non-banking transaction scenarios may improve compliance vigilance and outcomes. KYC investigative techniques may, for example, yield valuable information in jurisdictions in which true ownership may be difficult to ascertain or aliases/name variations are frequently used. With respect to government officials, status-based risk considerations, g., based on a PEP’s level of seniority, should inform dealings with them and their family members, close associates, and other relations. Think like regulators, and courts. Compared to highly specialized corporate legal and compliance practitioners, regulators and courts might be less inclined to take compartmentalized, and sometimes exclusive, approaches to legal interpretation and enforcement. Their views of laws’ scope, applicability, and interrelationships, as illustrated by pronouncements of U.S. enforcement authorities and courts in the FCPA context, may be more expansive than standard compliance programs suggest.For example, in discussing the meaning of “anything of value” under the FCPA, the DOJ and SEC pointed to court decisions broadly defining “the identical phrase under the domestic bribery statute”, implying their endorsement of or amenability to inter-statutory interpretation. (DOJ and SEC, A Resource Guide to the U.S. Foreign Corrupt Practices Act, November 2012, 14 & n. 86). In a 2011 decision testing the meaning of “instrumentality” under the FCPA, a federal district court declined to interpret the term narrowly to exclude state-owned enterprises (SOEs) from its definition (and thereby exclude from the definition of “foreign official” employees of SOEs). (United States v. Carson, No. SACR 09-00077-JVS, 2011 U.S. Dist. Lexis 88853 (C.D. Cal. May 18, 2011) Taking a teleological approach, the Carson Court observed that a constrictive interpretation would “work a[n] . . . impermissible narrowing of . . . [the FCPA,] a statute intended to mount a broad attack on government corruption.” (Id. at *20) (emphasis added). The court also reasoned that Congress’s inclusion of SOEs in the definition of instrumentality in a separate statute, the Foreign Sovereign Immunities Act, “ultimately support[ed] the . . . conclusion that an ‘instrumentality’ could include . . . [SOEs] under the FCPA. (Id. at 26). (Non-U.S. practitioners might find it useful to know that the FCPA and the FSIA appear under separate and thematically unrelated titles of the United States Code (the official compilation and codification of U.S. statutes (federal, not state); the FCPA under Title 15 (Commerce and Trade) and the FSIA under Title 28 (Judiciary and Judicial Procedure)).The fluid, policy-aware interpretive methods illustrated above should inform both compliance habits (away from rigid, rules only, reactive approaches) and specific policies. (E.g., in compliance programs, definitions of “things of value” should reflect potentially relevant interpretations; awareness of laws or legal areas dealing with seemingly unrelated legal issues, such as the treatment of SOEs as sovereigns (or not) for jurisdictional purposes should inform understandings of the potential scope of compliance obligations). Verify and Document. Verify the qualifications of prospective employees, consultants, or others and document the verification process to demonstrate that hiring and business decisions were without corrupt intent, even where being well connected and presumably able to develop business is a primary merit possessed. Arguably, there is an appreciable difference between hiring the well connected to aid business development generally and hiring a specific well connected person for the specific purpose of obtaining or retaining business from that person’s “foreign official” family member, close associate, or other relation. Erect Firewalls. Where a prospective or current employee, consultant, or other party is a PEP, steps should be taken, preferably in accordance with established procedure, to ensure that individual does not participate in, be positioned to influence, or have access to information or transactions/dealings involving persons or entities of concern for anti-corruption compliance purposes. Documenting the existence of a policy-based firewall—in employment or business contracts and/or regularly disseminated and updated policies, etc.—would likely bolster the credibility of a compliance program (assuming such documentation does more than create a paper trail solely for future defense purposes, a quality usually perceptible to enforcement authorities). Information Sources and Awareness; Local Knowledge. Effective compliance and risk mitigation require that information be collected in a timely manner, substantively integrated (e., connect the dots), and disseminated in a way that resonates with different internal constituencies. In collecting information, firms should not rely only on legal information; news, outside advisers, business and local grapevines, and other sources (properly screened) can also be informative for compliance purposesMoreover, relying only on annual or other periodic compilations of corruption perceptions will likely be insufficient; such publications may not adequately capture interim developments, track events on the ground, or reflect local knowledge. (The value of local knowledge is acknowledged in the AML context—for example, the FATF Guidance does not fix the range of persons that constitute family members deserving high risk treatment; the Guidance suggests (in relation to Additional Measures for Specific Customers and Activities) that definitions be tailored for local cultural and socio-economic factors)). Monitor, Internally Report Local (Anti-) Corruption Developments. Where foreign operations are concerned, information about local corruption perceptions and anti-corruption initiatives should be followed closely. For example, when a government announces an anti-corruption initiative—as recently happened in China when “President Xi Jinping launched a high-profile anti-corruption campaign, vowing to catch both tigers and flies—big and small corrupt officials”—such a development could influence local decisions to pursue, independently or in response to enforcement by foreign authorities, action against private parties (local and foreign) and corrupt officials (with whom a firm might be doing business). (See, g., Lijia Zhang, Author: In China, ‘everyone is guilty of corruption,’ CNN.com, Oct. 23, 2013).Importantly, information about local anti-corruption initiatives should be analyzed not only from the financial institution’s perspective, but also from the perspective of other relevant parties (such as foreign law enforcement). A local government’s announcement of an anti-corruption initiative might encourage foreign authorities to initiate enforcement actions involving that country’s officials. Local anti-corruption efforts might yield actionable information for foreign authorities. And negative diplomatic consequences may be diminished when foreign authorities act, or are perceived to act, consistently with local policy or political will. Alternatively, to incentivise local authorities to address corruption or for other reasons, foreign authorities might be interested in highlighting corruption in a specific jurisdiction or industry, regardless of local policy or diplomatic consequences.In addition, foreign political or policy developments might foreshadow changes in local law or business conditions, and corresponding risk. For example, in furtherance of political or policy developments, a type of payment to a foreign official that is permitted under local law might become outlawed, thereby creating new legal risk under local law and under the FCPA, under which the legality of a payment under local law is an affirmative defense to bribery. On the business side, local anti-corruption moves may adversely affect business relationships involving foreign officials, as illustrated by recent developments in China where SOE and other officials who had championed investments and joint ventures with foreign firms are under investigation for corruption. (See, e.g., Lucy Hornby, China corruption probe reaches western breakfast tables, Financial Times, July 30, 2014; The Economist, No ordinary Zhou, Aug. 2, 2014). (Notably, JPMorgan’s business dealings involving Chinese government officials’ relatives and associates reportedly involved the bank in the roles of underwriter, partner, and investor. China’s “tigers and flies” campaign would be of interest to JPMorgan or other financial institutions having direct or indirect financial or legal exposure to SOEs or PEP-related firms. (See JPMorgan and the Wen Family, N.Y. Times, Nov. 13, 2013). Disseminate Information Across Functions; Compliance Liaisons. Facilitate information flow across functions and locations, taking care to avoid unnecessary containment or filtering. Where functional lines are rigid, key parties are likely to process information in a way that is limited to their own expertise or function, resulting in blockage of information flow. If relevance is defined too narrowly, parties best positioned to process information for compliance purposes might never receive it, or receive it too late. To efficiently manage and disseminate information (particularly in larger organisations), firms should appoint internal compliance liaisons to serve as dot connectors who collect and process compliance-relevant news and information and disseminate it to internal constituencies in a way that resonates with different internal audiences. Provide Business Training for Legal and Compliance Personnel. Financial institutions and other entities typically provide legal and compliance training to business professionals (often to comply with standard training mandates of compliance programs). Cross-functional training should be reciprocal: to enhance business knowledge among legal and compliance personnel; enable quick connections between legal, regulatory and business dots; and, potentially, facilitate productive relationships between legal and compliance and business functions (these relationships too often are limited, reactive, or unnecessarily antagonistic). No compliance program will guarantee success in all cases. But adherence to formulaic approaches that have been consistently tried but inconsistently true is a path unlikely to yield optimal results. Cross-compliance approaches that leverage compliance knowledge in related areas and permit information sharing across functional lines reflect the intersecting dynamics of today’s legal and compliance landscape and may enhance overall compliance effectiveness. MassPoint PLLC, A Great BRIC Wall? Emerging Trade and Finance Channels Led by Non-Western Nations Could Curtail the Global Reach of U.S. Law. Hdeel Abdelhady, Cross-Compliance for Financial Institutions: The Antcorruption – AML Nexus, Butterworths Journal of International Banking and Financial Law and Companion Page (compilation of sources discussed therein). MassPoint PLLC, Globalized Anti-Corruption Enforcement: Direct and Collateral Consequences for Private and State-Owned Firms.